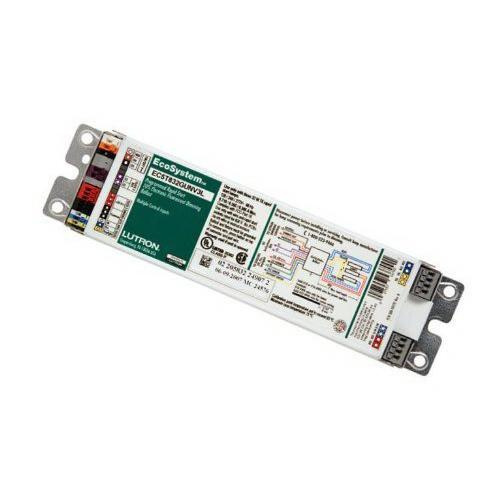 Lutron EcoSystem® High frequency ballast with integral sensor connection, is suitable to use with three 32-Watt 48-Inch F32T8 lamps. It has voltage rating of 120/240/277-Volt AC and current rating of 0.31/0.36/0.72-Amp. Programmed rapid start ballast with 0.85 ballast factor, offers 0.95 power factor. Ballast accommodates solid copper wire of size 16 or 18-AWG. Ballast operates at the frequency rating of 50/60-Hz. It provides Class P protection. Ballast measures 9.5-Inch x 2.38-Inch x 1-Inch. It provides continuous, flicker-free dimming from 100 - 10%. Ballast has five control inputs such as EcoSystem digital link, 3-Wire phase control input, daylight sensor, occupancy sensor and personal control. It has very low harmonic distortion throughout the entire dimming range and maintains consistent power quality. Non-volatile memory retrieves all ballast settings after power failure. Built-in sensor connection offers power and responds to one occupancy sensor, one photo sensor and one personal control input. It withstands temperature rating of 75 deg C. Ballast is UL listed, CSA certified, BAA compliant and meets FCC/NOM standards.